Summary (from the inside flap of the book): When Huck Porter's dad suddenly dies, it feels like nothing will ever make sense again. Huck's "best friend" thinks that Huck should just get over it, the girl he likes won't give him the time of day, and his mom now works all hours at a roadside diner to make ends meet. The only thing that still makes sense for Huck is the game his dad taught him, the game they spent hours paling together: Texas hold'em. Worse than all of that, though, is Huck's math teacher, Mr Abbott--a hungry card shark with an ego to match his appetite. He now wears the local poker tournament's first prize, a silver watch that Huck's dad wore proudly for three years. So Huck hatches a plan to knock Abbott off his throne and win back the watch. Only, bluffing his way into the tournament will mean lying to everyone Huck knows. 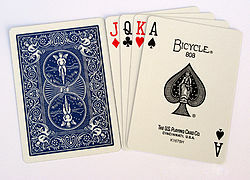 But as Huck gets deeper int the tournament and starts to lose himself in the cards, he begins to wonder who he'll be when the let hand is played. 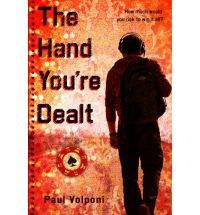 Review: I am a real fan of Paul Volponi's books, they have good characters and strong stories that I think are especially good for teenage boys. He isn't preachy but usually has a good message and his books connect with our students. But, this book turned out to not be my favorite of his. I don't mean it isn't good, it just isn't my top choice (that goes to Black and White). I liked the character of Huck, I feel like we got to know him, what's important to him, how he feels about his dad dying and how much he dislikes Abbott. I also thought the supporting characters added to the story even if we only knew them on a surface level, especially the other poker players. Poker isn't really my thing and that's probably what stopped me from rating this book higher than a 4. I've played and enjoyed it, but I am not really "into" it so the descriptions of the tournament didn't capture me the way they might other readers. But, I was definitely routing for Huck, I got caught up in the story, and I felt all the right emotions reading this book. Click to see my updated Google Map. 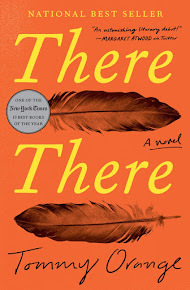 While Las Vegas, Nevada is the hot place to play poker and the eventual winner of the local tournament gets a free ride to play there, I am pretty sure this book takes place in California. They talk of Vegas being only an hour and a half away, but the main character says he is going to graduate high school and attend Cal State, a California University.